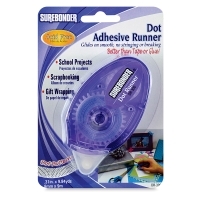 The Surebonder Dot Adhesive Runner leaves a clear dot pattern of adhesive in its tracks. Photo-safe and acid-free, it's perfect for scrapbooking, school projects, and wrapping gifts. The Dot Runner's adhesive glides on smooth, and its dot pattern prevents stringing and breaking. Materials can be repositioned at first, but the adhesive sets permanent. 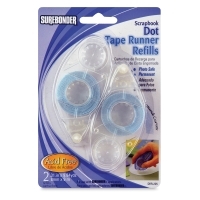 Easily refillable with Surebonder Dot Adhesive Runner Refill.